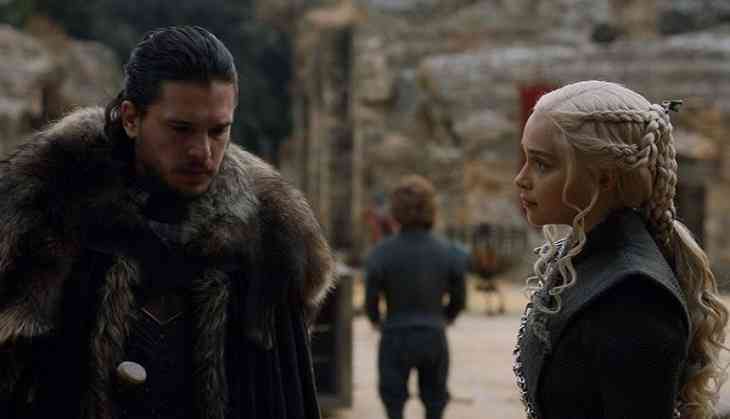 The season seven of 'Game of Thrones' may have only just finished, but fans are already wanting to hear some more stories from the seven kingdoms. To help everyone cope, HBO has released an in-depth behind-the-scenes series showing us just how much time and effort went into making the ground-breaking show. The series, entitled 'The Game Revealed', will be made up of seven parts, with a new episode released each Monday. episode has been uploaded to the official Game of Thrones YouTube channel, starting with a dissection of 'Dragonstone', directed by Jeremy Podeswa. One of the talking points from the episode, and in the clip, concerns Ed Sheeran, the singer popping up to discuss filming. The 'Shape of You' hit-maker revealed, "When I first got the scene and saw that I was a Lannister soldier and it was with Maisee, I just assumed we'd all get killed at the end. The underlying theme is that, as with any war, the soldiers are just young people and we're just young boys." Setting aside the Walking Dead-esque makeup and wardrobe done for the wights up North, this behind-the-scenes featurette has several highlights that make it worth watching. It should be noted that the next season of 'Game of Thrones' is not due to be released until 2019.